LightSquared may have steadfastly insisted otherwise, but recent tests showing that its wholesale 4G LTE network interferes with GPS have been getting tough for it to ignore, and it turns out the company has been quietly working on a backup plan. In addition to fessing up that one of the 10MHz blocks used by its network does indeed interfere with many GPS receivers, LightSquared has also now announced a two-fold “solution” to the problem. 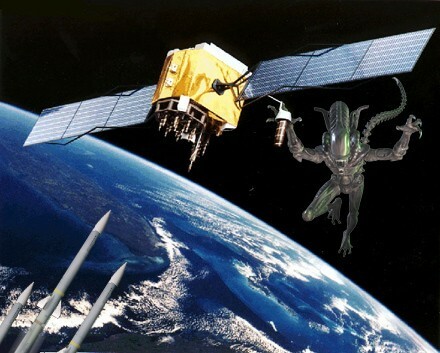 That will involve it using only a lower block of the 10MHz spectrum that it says doesn’t interfere with GPS (with a few “limited” exceptions), and a new agreement with Inmarsat that LightSquared says will let it “accelerate the schedule” to begin using the alternative block of spectrum. Those new measures, LightSquared says, will let it roll out its network in accordance with its original business plan, and give it enough spectrum to serve its customers for the “next several years.” What happens after that is a bit less clear, but LightSquared says it believes its network can “live harmoniously, side-by-side, with GPS users,” and that “enlightened and responsible spectrum management will give the American public the best of both worlds.” The company’s full press release is after the break. LightSquared announces ‘solution’ for GPS issue, says LTE network will roll out on schedule originally appeared on Engadget on Mon, 20 Jun 2011 17:28:00 EDT. Please see our terms for use of feeds. Well, looky here, Canon just let its hair down. The company was clearly in an experimental mood, and got the harebrained idea that consumers just might snap up red and brown DSLRs the way they do its candy-colored point-and-shoots. The outfit’s now selling its beginner-friendly EOS Rebel T3 in red, brown, and metallic gray — all in addition to your garden-variety black, of course. Sure, that’s tame by Pentax’s wacky standards, but for Canon it’s pretty… outlandish. Since the camera went on sale this spring, its price has dropped from $599 to a promotional $549 for the kit, which includes an EF-S 18-55mm f/3.5-5.6 zoom II lens. As for the body, if you’ll recall, it has a 12.2 megapixel sensor that records 720p video (a rarity for an entry-level model), a nine-point autofocus system, ISO 100 to 6,400, and a 63-zone dual-metering zystem. Novices who just want to be different can, as always, hit up the source link for more info. 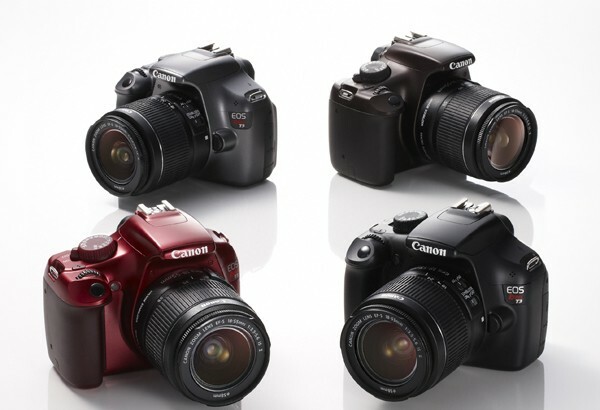 Canon takes a cue from Pentax, starts selling the T3 in assorted colors originally appeared on Engadget on Mon, 20 Jun 2011 17:09:00 EDT. Please see our terms for use of feeds. 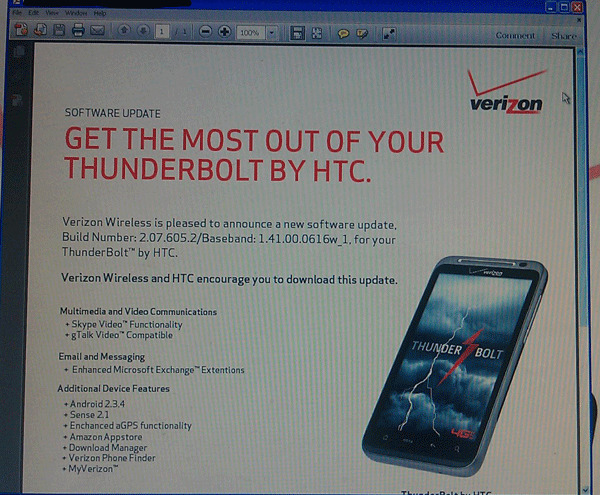 VZW leak teases HTC Thunderbolt update: Skype Video, Android 2.3.4 coming June 30th? It’s taken Verizon Wireless a painfully long time to get here, but it looks like the HTC Thunderbolt — the carrier’s once flagship 4G LTE device — might finally be getting the much talked about, but not-quite-officially delivered Skype with Video. We first brought you news of a leaked build back in April, but if this rumored June 30th release pans out, you’ll get to experience mobile video chat with your honeybun first-hand, as well as some Android 2.3.4 loving. As is the case with most carrier updates, Big Red appears to be loading this one up with some goodies — not just bloatware. Sure, the requisite VZW apps are on-board, but how’s about some Gtalk Video, a pre-loaded Amazon Appstore, and a handy fix for those irritating reboots? Keep in mind, we’re still firmly planted in rumor territory, but it does seem like Thunderbolt owners are getting closer to the initial dream. VZW leak teases HTC Thunderbolt update: Skype Video, Android 2.3.4 coming June 30th? originally appeared on Engadget on Mon, 20 Jun 2011 16:43:00 EDT. Please see our terms for use of feeds. This entry was posted on June 20, 2011, 5:40 pm and is filed under Mobility. You can follow any responses to this entry through RSS 2.0. Both comments and pings are currently closed.